Hugh Fearnley-Whittingstall, British television chef, journalist, and writer, stated in a recent interview that he believes eating puppy meat would be no worse than eating pork. A former (yet short-term) vegetarian, Fearnley-Whittingstall responsed to a question which asked whether he would be willing to consume pets. He explained, "In principle, but not in practice, I have no objection to a high-welfare organic puppy farm." While it seems as though the British chef is trying to make a valid point, he may have gone about it the wrong way -- as most people will not see the correlation between the two animals. However, those who are pro-animal rights have long asked the question: "Why is eating a pig any different than eating your family dog?" Fearnley-Whittingstall went on to say, "You can't object, unless you also object to the farming of pigs. It's an artificial construct of our society, a cultural decision, to make pets out of dogs and meat out of pigs. Both animals could be used the other way round, although pigs probably do make better meat than dogs and dogs better pets than pigs, but it's not a foregone conclusion." Having previously eaten "shocking" foods such as curried fruit bat and placenta pate, Fearnley-Whittingstall might have a tough time getting his point across. I must say I was stunned when I first heard his statements. After some careful thought, I've come to the realization that his narrative isn't far off from the thoughts of the average vegetarian. 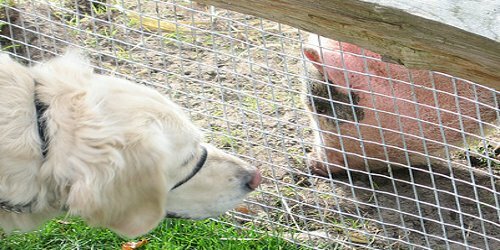 Whether it's your beloved dog or a pig on the farm that you'll never meet, they should be treated equally. After suffering with health issues for two years, Laeticia became a vegan and was able to go from barely walking to running 5Ks. During her life change she developed a newfound love and respect for animals and works hard to teach her son why we don't eat them. Follow Laeticia on her blog and Facebook.